My eyes rested upon Sans Bakery, named for its gluten-free goods (Sans = Without, as in Without gluten, get it?). Today, I was in search for protein. However, I didn’t have much hope, due to the lack of Passover season-friendly in this part of Queens. 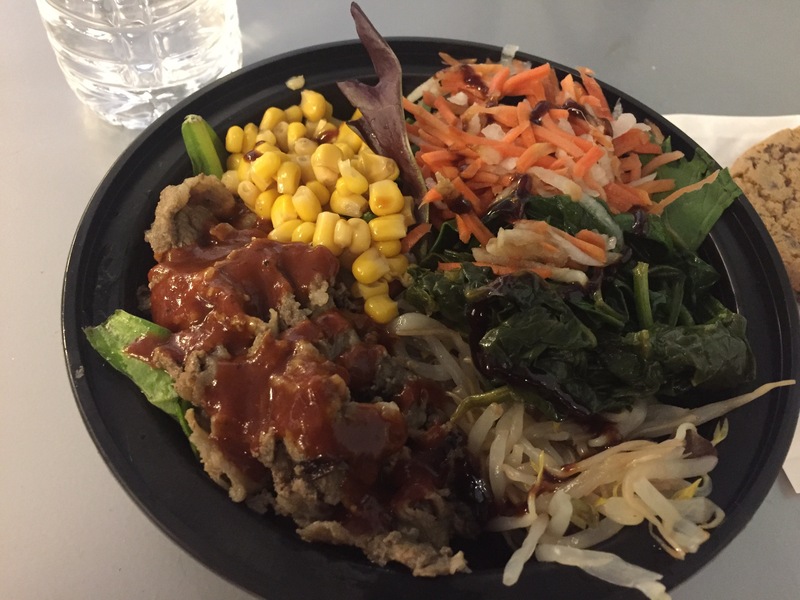 I chose the Bulgogi beef salad bowl, with spinach, bean sprouts, pickled shredded carrots, and corn, with some BBQ and plum sauce. I miss you beef, it’s nice to see you again. It was so tender and full of flavor. The vegetables were fresh, and I missed the rice; it should have some rice. According to the pink-haired, punk lady cashier at Sans, the gluten-free items are made with various kinds of of non-grain flours, like garbanzo flour, for example. I tried the chocolate chip Chai cookie, a vegan dessert that was doused with tons of chai tea spices in the batter. Very spicy indeed, and very dense cookie. So, this was a cheat day. However, since I’m a practicing Sephardic like my in-laws, eating rice, beans and corn are permitted during Passover, so I’m still good on some counts.